The gray area of the map shows the general boundaries of the WCID 17 service area. 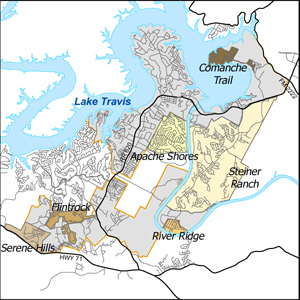 The District also includes four defined areas, Steiner Ranch, Flintrock, Comanche Trail and Serene Hills, and serves two out of District areas, Apache Shores and River Ridge. All areas pay the same water rates, but the defined areas have additional tax rates, and out of District areas pay fees in lieu of taxes and fees for revenue bonds issued for their water improvements.